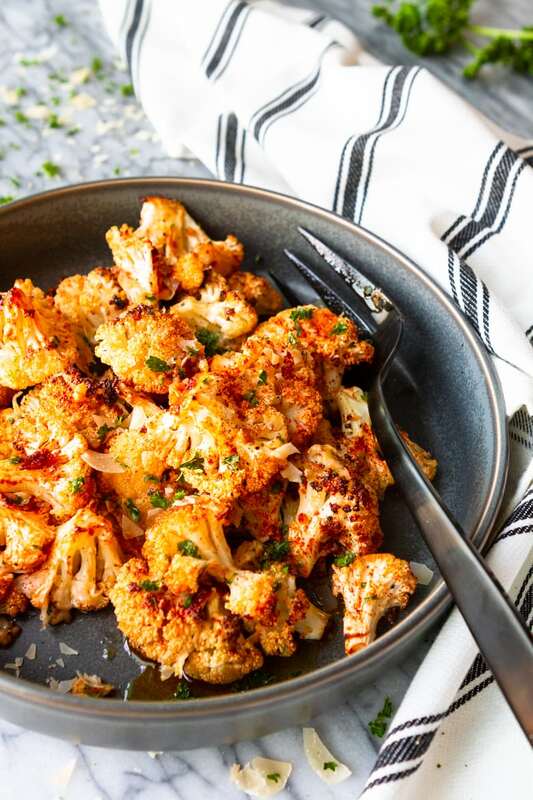 This smoky garlic Parmesan roasted cauliflower recipe is packed with the bold flavors of smoked paprika, garlic, and shaved aged Parmesan cheese. It’s the perfect easy side dish for any entree! In case you haven’t noticed, cauliflower has been enjoying a moment in the spotlight recently. I mean, it’s not at all unusual to find cauliflower rice, buffalo cauliflower wings, and/or cauliflower pizza on the menu at a restaurant these days. Just a few years ago, though? Not a cauliflower floret in sight. Not that I’m complaining or anything… I happen to adore the versatility of cauliflower rice, and I’m ALL about a good buffalo cauli appetizer. But hands down, my favorite tried and true cauliflower recipe to make at home is this easy Parmesan roasted cauliflower. 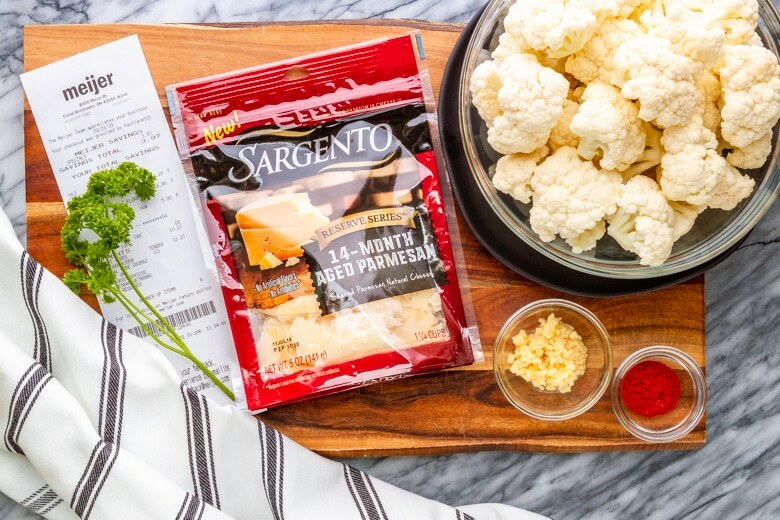 Cauliflower is truly the perfect blank canvas for the bold flavors in this recipe: smoked paprika, garlic, and rich, nutty Sargento® Reserve Series™ Shaved 14-Month Aged Parmesan Cheese. I have a feeling that this flavorful side dish is going to end up on heavy rotation in your weekly menu plan, just as it is in mine! You know I’m a big believer in sourcing the very best ingredients for simple dishes, such as this garlic Parmesan roasted cauliflower. But when bagged cauliflower florets are on sale 3 for $5 at Meijer? Well, you can bet I’m going to press the easy button and save myself some chopping. BUT the one ingredient I’m certainly NOT going to skimp on is the Parmesan cheese. Have you seen this new Sargento Reserve Series Shaved 14-Month Aged Parmesan Cheese at your local Meijer, yet? Look for it with the rest of the Sargento Cheese in the refrigerated dairy case. Its complex flavor (from the aging process!) totally elevates this simple roasted cauliflower to a guest-worthy side dish, while the shaved cut adds visual appeal to the finished dish. Wanna give it a try? You can save $0.75 off 1 Sargento Shredded Cheese package at Meijer with this mPerks offer right now. I highly recommend keeping a bag on hand at all times. I find myself sprinkling it over just about all of my favorite entrees and sides lately! Want to know my secret for how to roast cauliflower? Um, well… actually, there really isn’t one, LOL. I’m not one to overcomplicate things, so I pretty much roast any veggie I’m craving on a rimmed baking sheet at 425 degrees until it’s tender and a bit caramelized. Which is why I don’t line my sheet pans with aluminum foil like I often see recipes recommend. Besides adding an extra step, it actually inhibits that delicious caramelization we’re looking for! A well-seasoned rimmed baking sheet is worth its weight in gold, and the only way to achieve it is by roasting your cauliflower and other veggies with direct contact. You might save a few minutes in cleanup with the foil, but you’ll be missing out on SO MUCH FLAVOR. Oh, wait!!! I guess I DO have one secret I often use when making any kind of roasted vegetables… I keep my pizza stone in the oven on the bottom rack at all times. If I need to speed up the caramelization process, I place my rimmed baking sheet directly on the pizza stone. Just check your veggies a little more frequently, because they WILL cook faster! I know there are many of you reading this still wondering, “But HOW LONG to roast cauliflower?” I get it — you want to set a timer and forget about it for a bit. So I’ll share that, in total, it takes about 30 minutes. 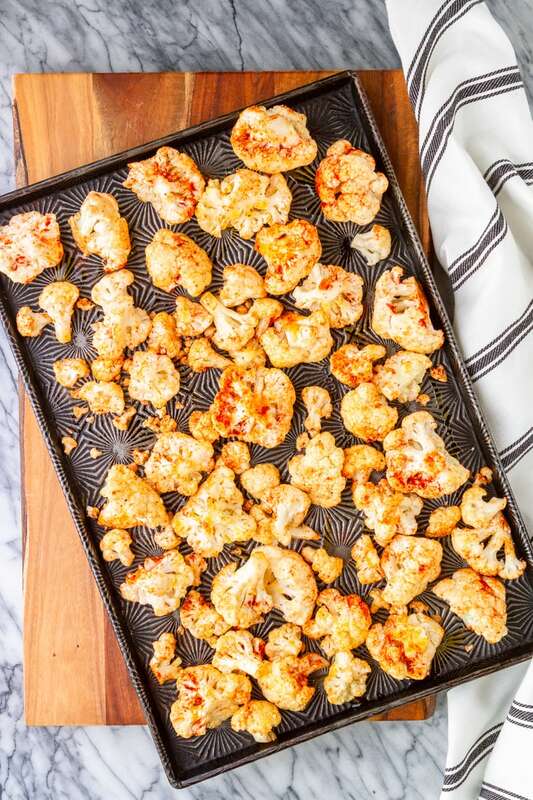 For this specific roasted cauliflower recipe, I first toss the cauliflower with some olive oil, smoked paprika, kosher salt, and freshly ground black pepper, and then roast it on my rimmed baking sheet for 20 minutes. Then I toss the partially roasted cauliflower with the garlic (this keeps the garlic from burning while the cauliflower is roasting), and sprinkle the crumbled Parmesan cheese over the top. The sheet pan then goes back into the oven for about 10 more minutes, until the cauliflower is tender and the cheese is melted. This Parmesan roasted garlic cauliflower is the ideal side for just about any entree: beef, pork, chicken, fish, you name it. But you know what? It’s also delicious served over brown rice for a hearty vegan meal. AND it’s even pretty tasty cold the next day… Yes, REALLY! Give it a try and let me know what you think. 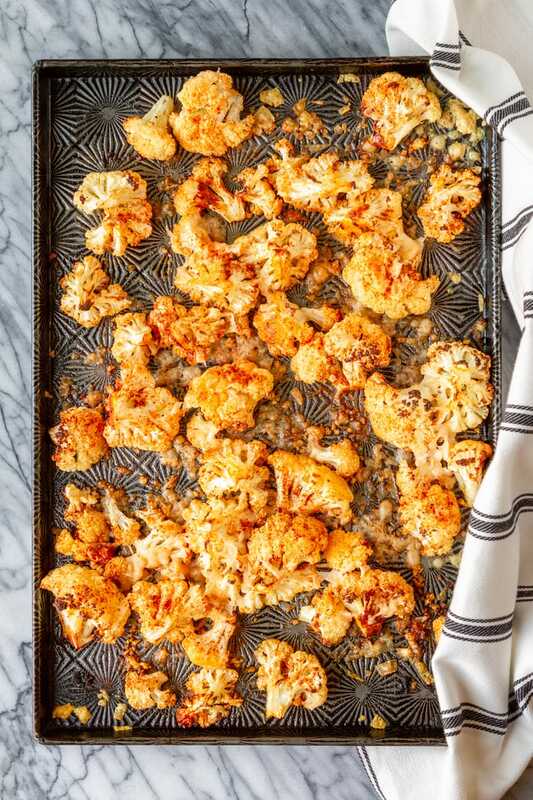 No matter how or what you serve your garlic Parmesan roasted cauliflower with, be sure to scrape up all of those little bits of caramelized garlic, cauliflower, and Parmesan from the baking sheet when serving this side dish. They’re TOTALLY the best part! And a good sprinkling of fresh chopped parsley over the top adds a bright pop of color and another layer of flavor. PIN IT NOW! CLICK HERE TO ADD THIS PARMESAN ROASTED CAULIFLOWER RECIPE TO YOUR EASY SIDE DISH RECIPES BOARD ON PINTEREST! 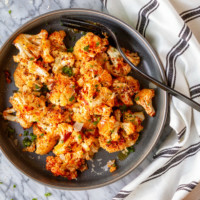 This smoky garlic Parmesan roasted cauliflower recipe is packed with the bold flavors of smoked paprika, garlic, and shaved aged Parmesan cheese. It's the perfect easy low carb side dish for any entree! 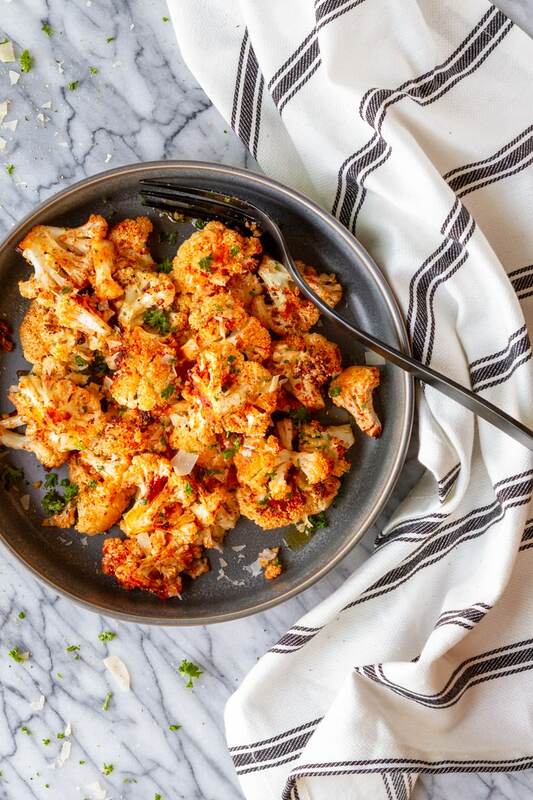 Cut cauliflower into florets of roughly the same size, and toss with olive oil, smoked paprika, salt, and pepper. Spread the cauliflower florets out on a rimmed baking sheet, and bake for 20 minutes. Remove the baking sheet from the oven, and add the minced garlic to the cauliflower, stirring and tossing to mix them together well. Sprinkle the crumbled Parmesan cheese over top of the cauliflower, and place the baking sheet back in the oven for an additional 10 minutes, until tender. Garnish with additional shaved Parmesan cheese and chopped fresh parsley. 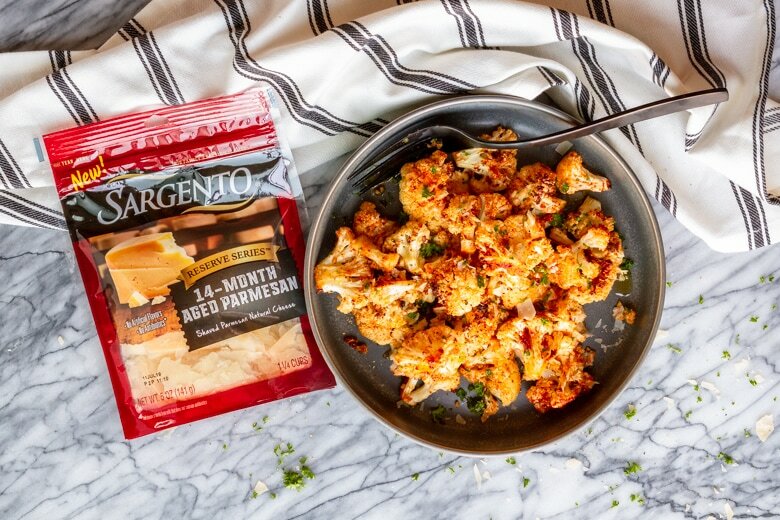 So you snagged a bag of Sargento Reserve Series Parmesan Cheese at Meijer for this Parmesan roasted cauliflower recipe, and now you’re wondering what else to use it on? Look no further! Here are a few more easy side dishes that would be fabulous with a little Parm sprinkled over top. Crispy Roasted Garlic Ranch Potatoes — these easy ranch potatoes are totally one of my favorite roasted potato recipes… Crispy and seasoned to perfection with garlic and ranch seasoning! Crispy Balsamic Brussel Sprouts — the most delicious crispy balsamic Brussel sprouts taste like your favorite restaurant sprouts but are healthy and easy to make at home. Za’atar Roasted Carrots — za’atar roasted carrots are a nice change from traditional roasted carrots. The earthy za’atar mixed with the fresh parsley adds a nice flavor to the natural sweetness that roasting carrots brings out. 20-Minute Crispy Cheesy Broccoli Gratin — this quick and easy crispy cheesy broccoli gratin features crispy, caramelized broccoli florets topped with a panko cheddar Parmesan mixture that’s out of this world… Have it on your dinner table in under 20 minutes! Indian Spiced Roasted Vegetables — Indian spiced roasted vegetables makes a healthy side dish that pairs well with almost any protein. Fresh cauliflower, tomatoes, and white beans, flavored with earthy spices and oven roasted. It’s a perfect meatless meal main dish option, too. I’d love to see how your smoky garlic Parmesan roasted cauliflower turns out… Tag me @Unsophisticook on Instagram or use the hashtag #Unsophisticook so I can check it out. Enjoy! So tasty! I love roasted cauliflower, but adding cheese made it even better! Yum! This looks like the perfect side dish! This turned out fantastic. So much flavor we loved it! We loved this. We love cauliflower anyway but the added flavor here is incredible! Oh wow this looks so good! 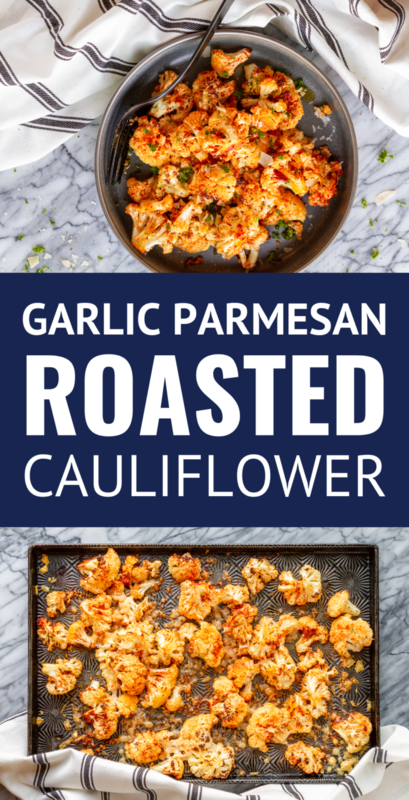 I love cauliflower and garlic and parm and this is literally the best of all that! You had me at garlic and parmesan. Will be making these soon. This looks delicious! Will make a great (and healthy) side dish with dinner tonight! This looks like such a tasty dish – roasting always helps veggies, in my opinion, and the flavors you added sound great as well. I made this to go with our dinner last night, and it was a hit with everyone! Thanks so much for sharing! This cauliflower sounds so flavorful and delicious.